These are adorable! Would look nicely as a belt (on humans), too. Very cute and creative, nice job! Those are great patterns. 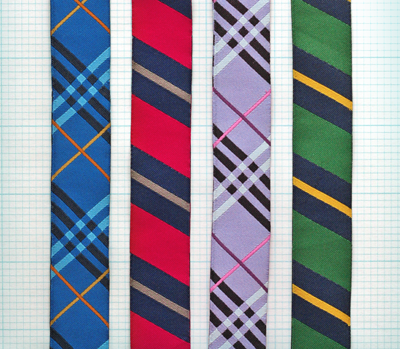 I want all of those ties as neckties for my 1 1/2 year old. So cute! I wish our dogs could wear them, but pugs aren't supposed to have collars. Any chance of harness versions? really nice, love the lavender one, it's an unexpected color. preppy dogs will be stylin with these! What if I just want to buy the ribbon? Is that possible? OH EM GEEEE!! I love these, these are awesome and I will buying them for all present and future dogs. Thanks!!! Stephanie, sorry! 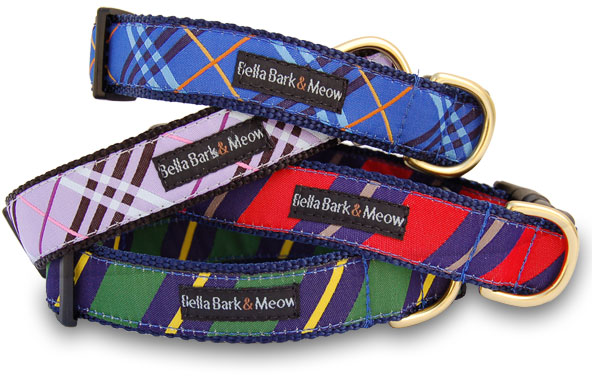 Bella Bark and Meow doesn't sell ribbon by the yard; just ribbon already made into stuff. These make me want a dog! I'm pretty sure my kitty is way too tiny for these. Love love your blog...stop by here a lot, but have never commented before. I am sad that I am not a dog. Because you wish you could wear a necktie collar, or because you wish someone would buy a $350 poop bag holder for you? I wonder how much it would cost to bedazzle a toilet. Hmm. According to Google, you can get a bedazzled toilet for the low, low price of $25,000. It makes that poop bag holder look like a steal in comparison! Aw, I'm blushing down to my crystal encrusted shoes!